Set just before the election of 2015, SCREEN PLAY envisions a future ruled by a conservative religious majority. The economy is sagging, wars are raging and culture is in decay. Many Americans have begun to flee to Canada and Mexico as the government struggles to stop pandemic reverse immigration. 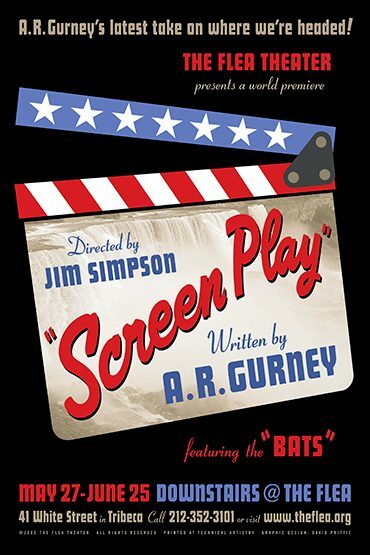 With a plot borrowed liberally from a classic 1942 American film, SCREEN PLAY is a tale of politics, history, the city of Buffalo, and a love ruined by the Bush-Gore election of 2000. Playwright A.R.Gurney’s plays include Scenes from American Life, Children, The Dining Room, The Middle Ages, Sweet Sue, The Perfect Party, Another Antigone, The Cocktail Hour, Love Letters, The Old Boy, The Fourth Wall, Later Life, A Cheever Evening, Sylvia, Overtime, Let’s Do It (a Cole Porter musical), Labor Day, Far East, Ancestral Voices, and Buffalo Gal. His novels include The Gospel According to Joe, Entertaining Strangers and The Snow Ball. He is the winner of Drama Desk, N.E.A., Rockefeller Foundation, New England Theatre Conference, Lucille Lortel, American Association of Community Theatres, American Academy and Institute of Arts and Letters awards and he holds honorary degrees from Williams College and Buffalo State University. Gurney was on the faculty of M.I.T. until 1996. He is the husband of one, father of four, and grandfather of six. SCREEN PLAY runs September 8-30, Monday – Saturday at 7pm, with additional 3pm matinees on Wednesday & Saturday.